Last year at Sundance, documentarian Lee Hirsch's latest feature The Bully Project drew notice for its unflinching look at the peer-to-peer bullying problem that has overtaken American schools. Many adults write off bullying as an unfortunate but unavoidable part of growing up, dismissing it with the thoughtless cliché "kids will be kids." However, Hirsch's doc explores how this kind of parental neglect is leading to a whole new level of kid-on-kid cruelty. With the emergence of cyber-bullying, the kids who are being harassed are often relentlessly tormented. It's a crisis that's leading to attacks, trauma, and suicide nationwide, and Hirsch and the Weinstein Company, which is distributing the doc, are looking to draw focus to the issue of bullying with the film's impending release, and a promo poster that unveils a new name: Bully. "Bullying is not only a problem present in our classrooms, on our playgrounds, and online; it's a ubiquitous and harrowing component to everyday life for millions of American children and adolescents. We feel that simplifying the title to BULLY allows us to underline the fact that the film addresses a universal crisis that effects us all." It's a pretty sharp image, both graphically and metaphorically, alluding to the various signs around schools meant to protect children from catastrophe. Still, the names scrawled into the word "BULLY" seem pretty mild compared to the insults I remember being thrown around the playground, or those I overhear students spout on public transit. Basically, I don't think this is a proper reflection of the kind of abuse the film reveals, but that doesn't lessen my interest in this buzzed about doc. Bully follows five families over the course of one year to reveal how the children of these families are affected by bullying. Shocking footage reveals not only the bullying itself but the harrowing repercussions it wreaks on its victims. Two of the featured families have lost their children to suicide, while another mother awaits news of what will become of her 14-year-old daughter, who brought a gun aboard her school bus after being repeatedly threatened and harassed. 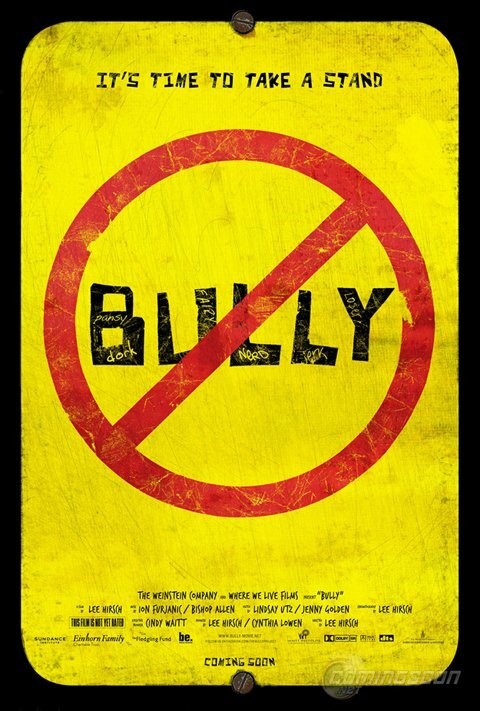 More than a movie, Bully is meant to be part of a movement that will combat the problem of rampant bullying. To learn more, check out The Bully Project website. Bully opens in limited release March 9th.